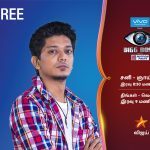 Raiza Wilson, Arav, Sri, Anuya, Gayathri, Oviya, Aarthi, Ganesh, Sakthi, Namitha, Bharani, Vaiyapuri, Ganja Karuppu, Juliana are bigg boss vijay tv participants. celebrities, non celebrities, film stars, poet, model etc are in the list. we can check the images and other details of the show. 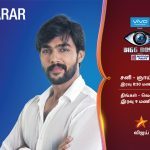 vijay tv will bigg boss tamil air everyday at 9.00 p.m and you can watch repeat telecast on 11.00 p.m. if you are missing the episodes on tv , it will available on hotstar app. 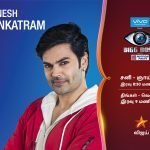 Presented by Star Vijay TV and produced by Endemol Shine Productions, Big Boss will feature 14 celebrities living together inside a custom made ‘Big Boss’ house for 100 days. The participants will be completely cut off from the outside world – they will have no access to internet, phones, television or newspapers. With no way out to distract themselves, each participant will have to compete with others inside the house to complete various tasks; they will be tracked, monitored by 90 odd cameras placed inside the house even while they are asleep. The lavish Big Boss house will have two bedrooms, a living area, kitchen, store room, confession room, garden area with swimming pool, a smoking room, gym, bathroom and the activity area. 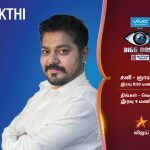 While there is immense speculation about names of the celebrities, we will have to wait until the first episode airs on June 25, Sunday at 8.30 pm, which will feature for 3 hours as a launch special. 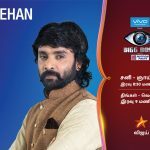 SNEKHAN IS THE BEST PERFORMER IN A BIG BOSS HOUSE . 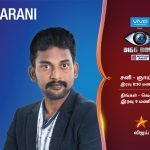 HE IS THE WINNER OF THE BIGBOSS. I LIKE YOU SNEKHAN. MY BEST WISHES FOR YOU SNEKHAN.